Hickson Compact Group 90 (HCG 90) is a tight cluster of 16 galaxies (including many dwarf galaxies), located approximately 100 million light-years away in the southern constellation of Piscis Austrinus (the Southern Fish). 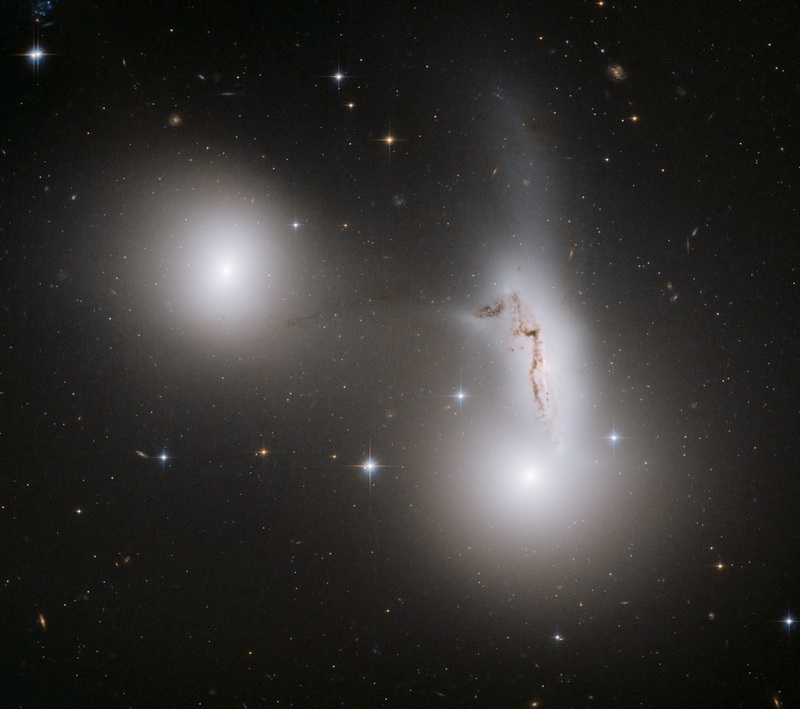 These three strongly interacting galaxies — NGC 7173 (middle left), NGC 7174 (middle right), and NGC 7176 (lower right) – are prominent members of this Group. The image spans about 80,000 light-years. Galaxies, like stars, frequently form groups. The Canadian astronomer Paul Hickson published a list of 100 of these small clusters of galaxies (462 galaxies), now called Hickson Compact Groups (HCGs), in 1982. NGC 7173 and NGC 7176 appear to be smooth, normal elliptical galaxies without much gas and dust. In stark contrast, NGC 7174 is a mangled spiral galaxy that appears as though it is being ripped apart by its close neighbors. This mangled galaxy may have once looked more like our Milky Way, a pinwheel-shaped galaxy. But now, its dust lanes are being stretched and warped by the tug of gravity. Unlike the elliptical galaxies, NGC 7174 is rich in dust and gas for the formation of new stars. Ultimately, this distorted spiral galaxy will probably be swallowed by the two elliptical galaxies (NGC 7173 and NGC 7176), and only these two will remain. This will trigger a firestorm of new starbirth that will last for many millions of years. Eventually the ellipticals should merge too, creating one single super-galaxy many times larger than our Milky Way. In the meantime, the galaxies are experiencing a strong gravitational interaction, and as a result, a significant number of stars have been ripped away from their home galaxies already. These stars are now spread out, forming a tenuous luminous component in the galaxy group. This image is taken in May 2006 with the Advanced Camera for Surveys onboard the Hubble Space Telescope.